at Martin Batchelor Gallery May 27-June 22, 2017. Opening Sat May 27 6–9pm. Artist in Attendance. Marshall and Donna Soules. In 1981, Donna sat for many hours as a model for Diana Dean. The sitting was an interesting experience for the young woman who later found and purchased Donna on Chaise Loungue. Marshall Soules writes eloquently about Diana Dean’s artistic process and complex subject matter. 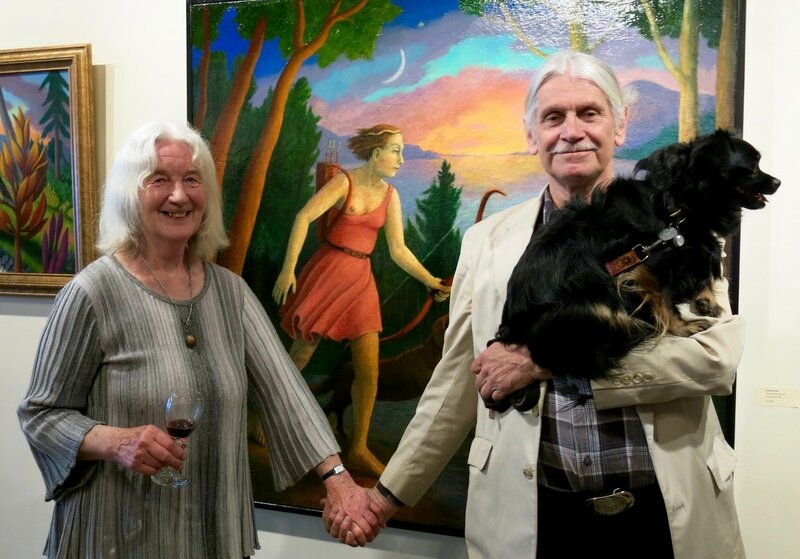 The couple are ardent supporters of Diana’s artwork and professional development. Susan Devor Cogan is a singer/songwriter from Salt Spring Island. She feels lucky to own an original Diana Dean and came to support her talented friend. Diana Dean’s home-studio perches on a wooded hilltop near the northern shore of Salt Spring Island. Since 1982, the artist has painted her large-scale dramatic compositions in this space. Looking around, it seems natural that the artist’s landscapes sing out the multi-hued splendour of her island home. The natural and the supra-natural blend effortlessly in her mythic environments peopled with saints, peasants, lovers, and protagonists. Themes include a multitude of relationships: inner nature and outer expression, bonds with friends and family, and myriad elements of earth, sky and sea. 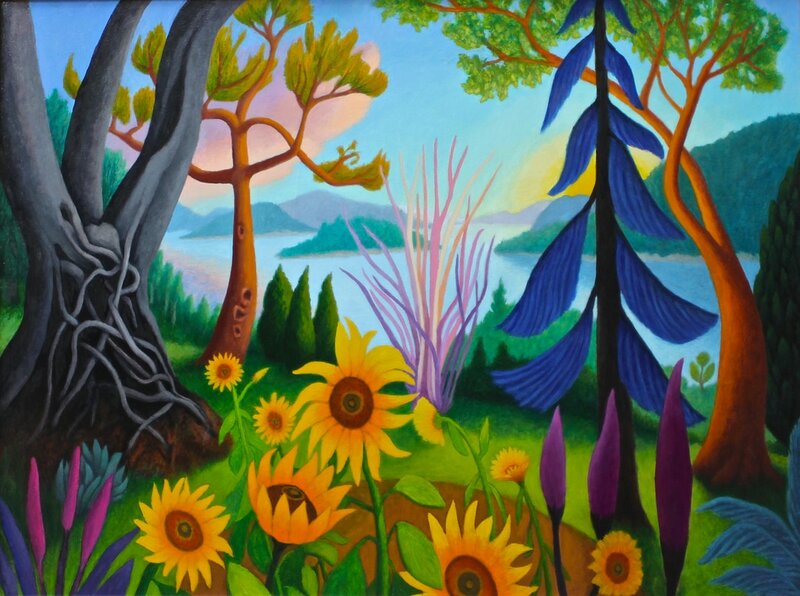 She strives to bring the essence of her inner vision into her paintings. Chichester Mews, oil on canvas, 30x30 in, 2014 from 1960 powder painting. Wood Spirit, oil on canvas, 5x3 ft, 1987. The Ritual, oil on canvas, 4x5 ft, 1986. The Passage, oil on canvas, 54x54 in, 1993, reworked 2017. 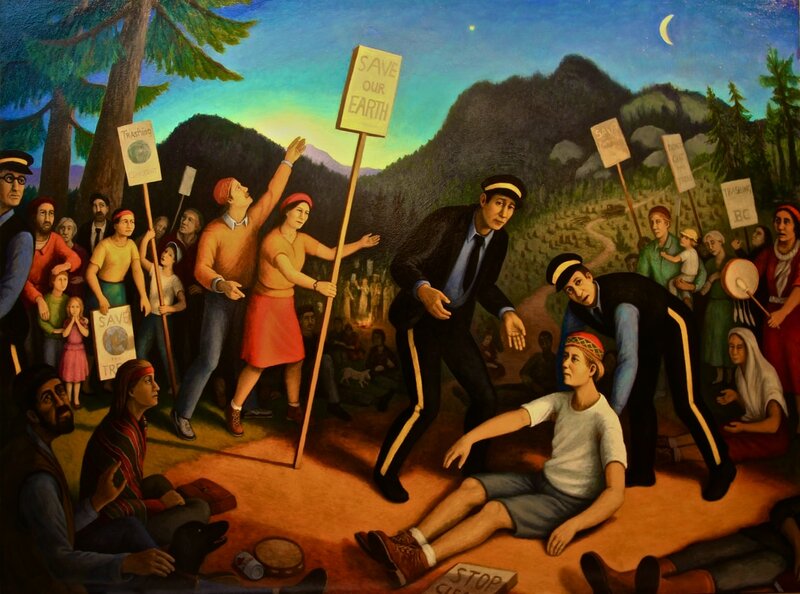 Clayoquot - Morning of the Demonstration, oil on canvas, 6x8 ft, 2010. 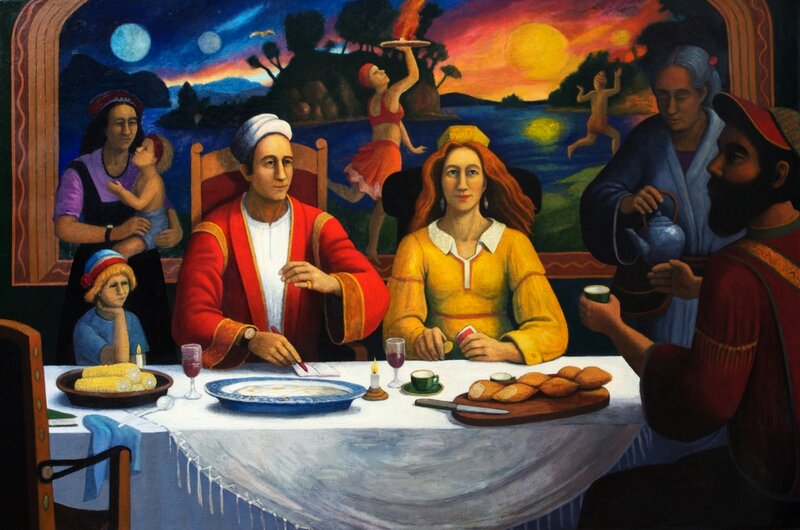 Dante and Beatrice, oil on canvas, 54x81 in, 2004, reworked in 2017. Diana Dean is an expert colourist who often uses saturated tones for emotional impact. Subtle shading found in skies and waterways add warmth and wonder to the works. Her paintings appear to glow with an inner light that invites the viewer into imaginary worlds. Dean’s paintings are built up with many layers of oil paint. She uses a blend of stand oil paint, damar varnish and turpentine. After each layer she adds another ounce of oil paint to the medium to prevent cracking. With oil paint taking many days to dry, she usually works on more than one canvas at a time. To remove lumps, the artists sands the canvas, then adds a final glaze. 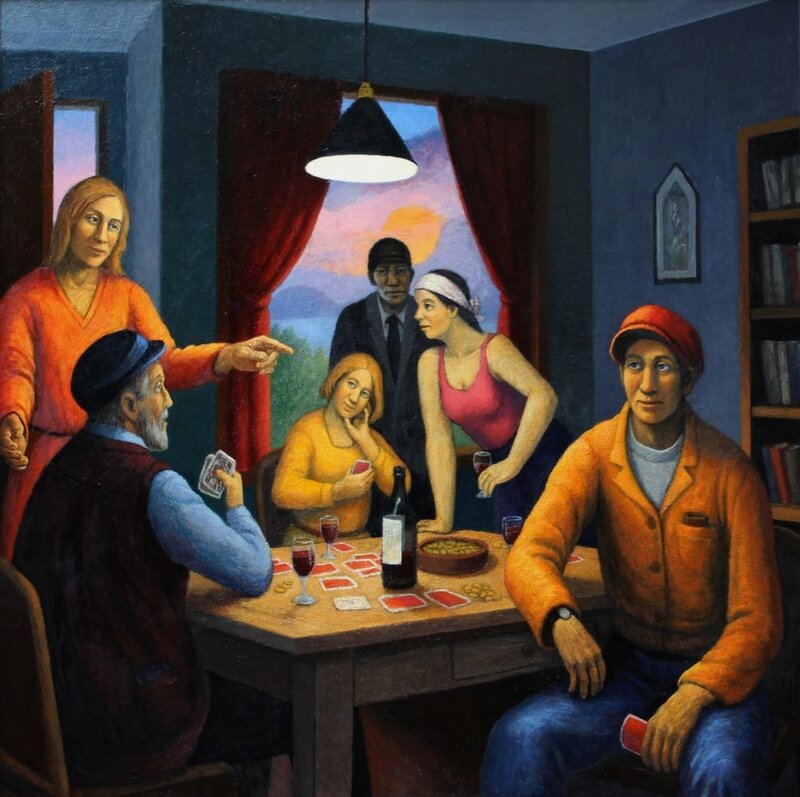 The Calling #1, oil on canvas, 48x48 in, 2008. House at Central, oil on canvas, 30x24 in, 2015. Waterfall in the Valley, oil on canvas, 30x40 in, 2014. Erasmus, bronze, 14x9x7 in, 2007. Rebirth, bronze, 30x6x7 in, 2017. Cast at Burton Bronze Foundry from a 1964 wood carving by Diana Dean. African Family, bronze, 15x14x9 in, 2008. Martin Batchelor Gallery is located at 712 Cormorant Street. Hours: Mon–Sat 10am-5pm. Diana Dean and Stephen Glanville at Martin Batchelor Gallery on May 27. Kate in March 2017 at Diana Dean's Studio on Salt Spring Island.